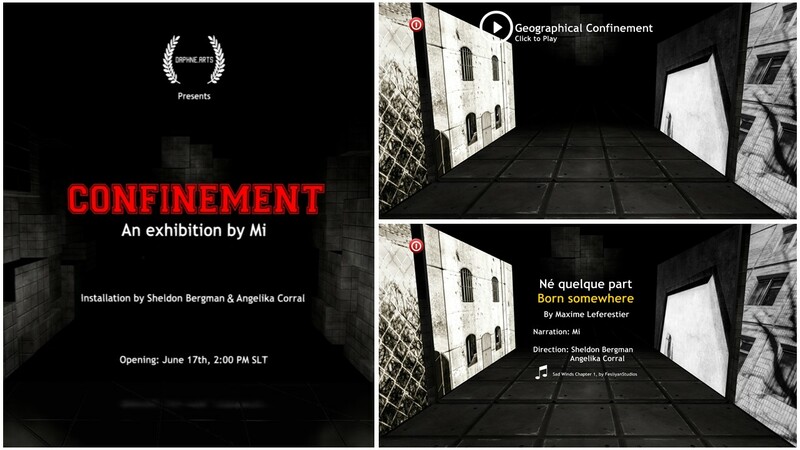 Tuesday, June 19th, I visited “Confinement“, a new exhibition by Mi (kissmi) at Daphne.Arts that opened just recently. According to Mi, “the confinement is our lot – from the beginning, in the womb, and even before, as soon as the idea of our conception germinates in the minds of our parents, enclosing us”. Created by Angelika Corral and Sheldon Bergman, who own Daphne.Arts and provide the space to other artists, the installation is divided in 4 sub sections: geographical, mental, physical and social confinements. Before you enter, you’re asked to attach a HUD. The HUD provides sound and text and is necessary for the experience. You will also be asked to set your viewer to advanced lighting and to shadows (moon and projectors) and to either accept the windlight or set your viewer to no light. You enter a long and dark hallway and have to dare to keep walking forward. Then the scenery is lightened and you can see pictures at the walls to your left and right side. For each sub section (geographical, mental, physical and social confinements) there is a poem related to its theme and narrated by Mi. 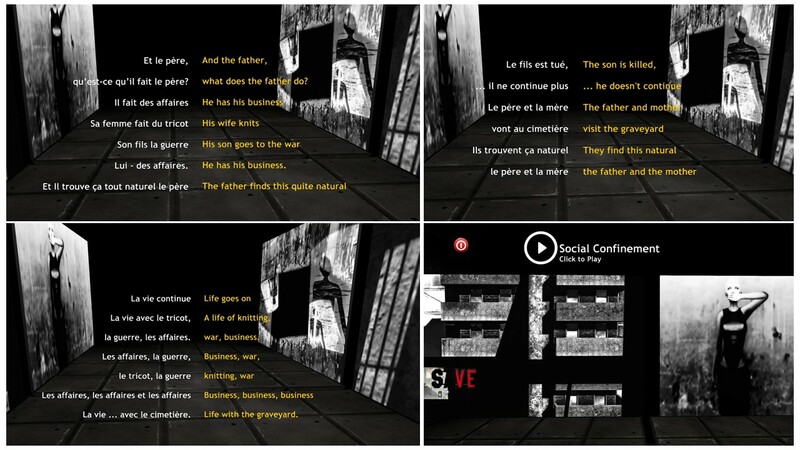 The narration is in French, the HUD provides a transcript in French and in English. The poems sound really nice in French, some alliterations of the poems can only be heard in French tough and don’t have the same effect in English. The pictures and the poems build one unit, they fit together. The poems leave the visitor very thoughtfully. Each sub section has it’s own message. Geographicallyy it is the place you’re born, the many coincidences that lead to our own life, yes we’re equally born but not with equal chances. We have many confinements mentally, physcially and socially. Walking through the exhibition “Confinement” you walk through a whole life from birth to death, and life will go on. At the end of the hallway you walk downstairs to experience a fifth section without a poem going with it – “Constrained Confinement is, in every way, an ultimate impasse”. The stairs leading down are illuminated by torches. You step down deeper and deeper until you reach a place lit by candles. At the end of the place is a statue with an open torso. It might symbolize a murder as one hand strangles the throat, it might symbolize another new life as another hand reaches out through the open torso holding a candle. It is an impasse, so you have to either walk back or teleport out from there. 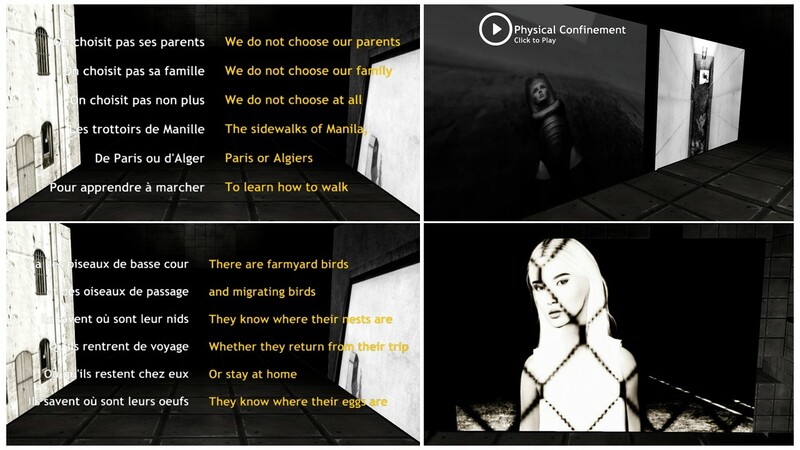 “Confinement” by Mi is a particular form of art, combining poems (narrated and readable), music, pictures and the visual experience of Second Life into one piece of tangible art. I understood that Angelika Corral and Sheldon Bergman were responsible to make that happen. Again an exhibition you won’t see anywhere else but in Second Life. DaphneArts, opened in March 2016, is an art complex that features monthly exhibitions, with a strong focus on the grotesque, surreal and existential themes. It is owned by Sheldon Bergman (sheldonbr) and Angelika Corral. Thank you and Mi for this exhibition!